A Mothers Ramblings: Top Ender Doesn't Love Me! On Sunday, after Dan Jon, Top Ender and I returned home from Church, Top Ender asked Flyfour if he was up for making some cupcakes with her later that afternoon. 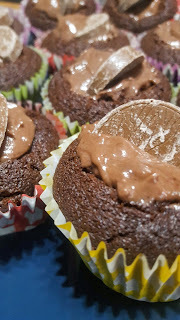 Since our trip to Aldi the previous day, when they had found some Chocolate Orange segments, they had been talking about making some Orange flavoured cakes and as we had all the ingredients needed it was a given it was going to happen. After we'd had lunch and put the dishwasher on, they made some Cupcakes together. They had a blast and when they'd finished, they asked if I would like one. Which I didn't, because as Top Ender and Flyfour well know I am not a fan of flavoured chocolate, in particular, I'm really not a fan of orange flavoured chocolate. There is only one logical conclusion. Top Ender doesn't love me!